The Foundation for Global Sports Development has supported Childhelp's ongoing mission to prevent and treat victims of child abuse and neglect for over twenty years. 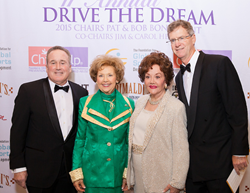 The Foundation for Global Sports Development’s (GSD) executive board members, Dr. Steven Ungerleider and David Ulich, have been named “Heroes of Prevention Education”, and will be presented with the “Childhelp Hero Award” at Childhelp’s 12th annual “Drive the Dream” Gala. The Gala is taking place this weekend at the Biltmore in Phoenix, AZ, and will feature a “Celebration of Heroes” to spotlight true champions of child abuse prevention and treatment. The Phoenix Police Department and Phoenix Children’s Hospital will also be honored with the award. GSD has supported Childhelp’s on-going mission to prevent and treat victims of child abuse and neglect for over twenty years. In addition to funding Childhelp’s Residential Treatment Village Programs, GSD underwrote the Childhelp “Speak Up, Be Safe for Athletes” toolkit, a prevention education initiative aimed at promoting the safe physical, emotional, educational, and spiritual development of youth athletes. “We are beyond honored to be receiving this award alongside members of the Phoenix Police Department and Children’s Hospital,” says GSD executive board member, Dr. Steven Ungerleider. “We will continue to support Childhelp’s fight against child abuse until it is no longer an issue, and all children are safe,” added GSD executive board member, David Ulich. To learn more about the prevention and education program “Speak Up, Be Safe for Athletes”, you can access the Speak Up Be Safe for Athletes curriculum. Working closely with international sports federations, generous donors and committed athletes, The Foundation for Global Sports Development promotes sportsmanship, education, fair play and ethics among the world's youth. The Foundation gives special emphasis to groups and communities that are most in need or most underserved by current programs, including women, minorities and youth in areas where the risk of delinquency is particularly high. Visit http://www.globalsportsdevelopment.org to learn more. Founded in 1959 by Sara O'Meara and Yvonne Fedderson, Childhelp® is a leading national non-profit organization dedicated to helping victims of child abuse and neglect. Childhelp's approach focuses on prevention, intervention and treatment. Childhelp® exists to meet the physical, emotional, educational, and spiritual needs of abused, neglected and at-risk children. We focus our efforts on advocacy, prevention, treatment, and community outreach. Childhelp is headquartered in Phoenix, Arizona. For more information, please visit http://www.childhelp.org.